As I’ve mentioned before part of teaching a class with others is that you get to take the other’s classes too, and be inspired by what they’ve created. For free! 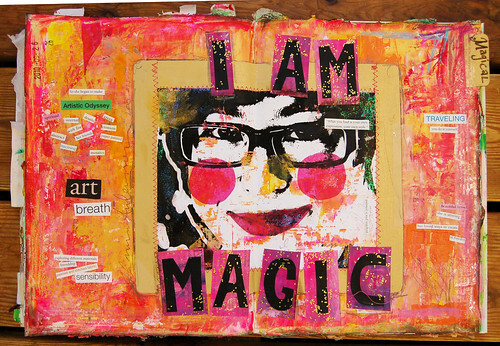 In 21 Secrets I started this autumn with Andrea Schroeder’s class that is called I Am Magic. It guides you through the process of using your art journal to embrace intuition and flow and discover your inner magic. Andrea wants us to find that place where we know that we can do anything! A inner place of magic that we reach with the help of her guided visualization meditation. When I was lead into my magic place I went into a huge cave with pink walls what was shining with pink glitter. It was like I was inside a giant disco ball and everything was sparkly and bright! I was almost dazzled in there, I think it must mean that my magic is quite strong when I dare enter into it, but also well hidden from my every day (deep down in a cave somewhere in a dark mountain of fear…). I really love that place, as you can imagine as it is the place where I could do anything, so I am planning another visit soon, even though it might be difficult to find it without a guide. 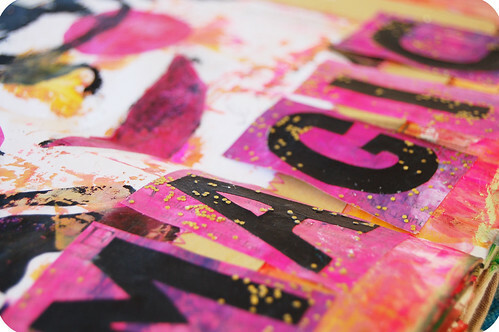 When I came back from my visit in the magic cave I tried to hold on to some sparks, and I followed Andrea’s description on how to create an art journal page using the magic creativity I found. Maybe the page itself is a map. 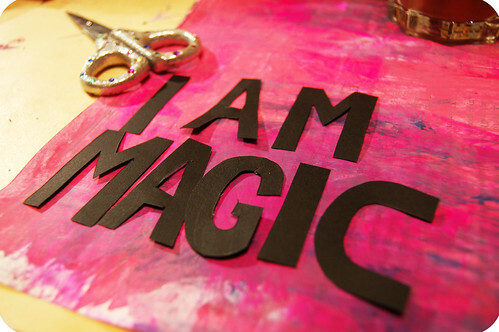 To emphasize that indeed I am magic those words must be on the page. I wrote it in bold letters over a photo of Me, framed in gold. 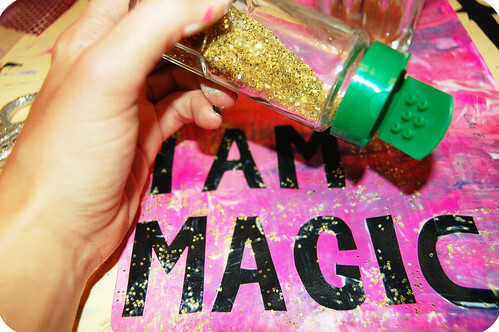 I also added glitter, and then a few cut out words that is supposedly saying something about “my magic”, I think. See details of words below. Magic scissors for cut & paste magic. Wrote big block letters on black paper and then cut them out using my “magic scissors”. Laying them out letter by letter to form the words was like slow writing. I loved it! I don’t know why I haven’t cut out letters before, it is easy and creates a fun effect. I cut out English words that jumped at me from these old art magazines that I got from a blog friend a few years ago now. This is important! 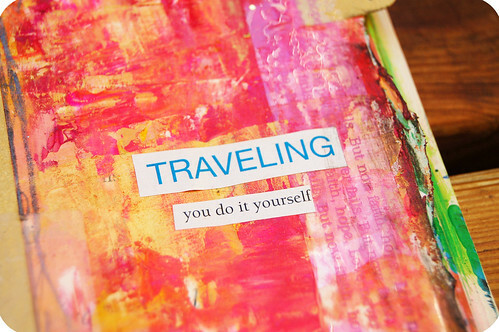 I like both inner and outer travels. More “magic” words that just seemed appropriate right now, for me, this year. 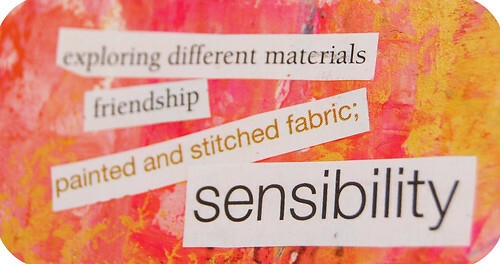 Thank you Andrea for your class, and for featuring my art journal page on your blog. Registration for 21 Secrets is now closed, but the fun in the class will continue until February next year. This entry was posted in Art journaling and tagged art process, learning, meditation, online classes, self love, soul searching. Bookmark the permalink. Will you email me your snail mail address? you are SO very magic! 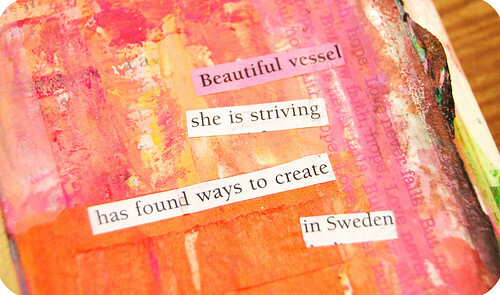 I get so much inspiration and comfort from reading your blog… so I believe your magic is spreading out into the world. thank you for sharing this magical glimpse into your dazzling pink cave. 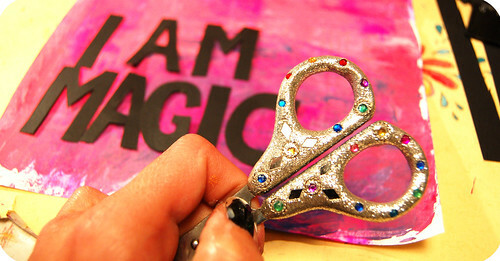 I love the page and the process and that you have sparkly scissors! yah! i loved seeing more of your process on your amazing magic page. Thank you for your kind comments girls! I am always so moved by your words, you are all so generous back and it feels good to be apart of your world. Thank YOU! Thank you for sharing your art and finding with us. thanks. great art though! :) you can spread it.